Sometimes, something catches your eye, and you feel you’ve just tasted the future. So it was in a military conference in the Norwegian mountains this week. S Korea is developing software and hardware that may profoundly change the way we learn. We’ve seen the commercial launch of some primitive toys using brain sensors (see my previous post) but we’ve yet to see brain and situation sensor technology really hit the world of learning. Learning is wholly about changing the brain, so one would expect, at some time, for brain research to accelerate learning through cheap, consumer brain and body based technology. That has already happened through sensors on games consoles, such as the Wii and Xbox Kinect, but there’s a more serious game on the go, in the land of obsessive gaming (S Korea), that could profoundly change the world of learning. 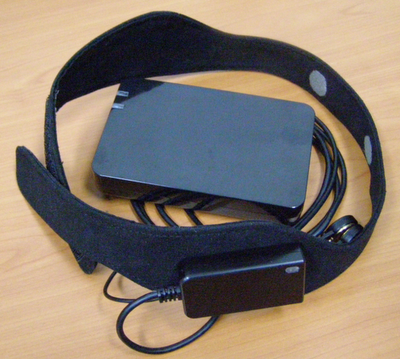 With the development of an ’emotional sensor set’ that measures EEG, EKG and, in total, 7 kinds of biosignals, along with a situational sensor set that measures temperature, acceleration, Gyro and GPS, they want to literally read our brains and bodies to accelerate learning. It’s an ambitious project that includes an emotional learning index (gathered from experimental data), middleware (device comms, analysis and recognition software), and a personal learning module and along with tools for content development. They hope to significantly increase the effectiveness of learning experiences, not only learning about the control of emotion but also a general lift in the effectiveness of all learning, through increased focus and attention, whatever is identified as being the ideal mental and physical state for optimal learning. This is ambitious. It’s technology driven metacognition. I think there are problems with this approach as it’s not yet clear that the EEG and other brain data, gathered by sensors measure much more than cognitive noise and general increases in attention or stress, and how do we causally relate these physiological states to learning, other than the simple reduction of stress. The mesures are like simple temperature gauges that go up and down. However, the promise is that a combination of these variables does the job. However, this is the start of an important research journey, where learning is improved by understanding what state we need to be in when we learn. My guess is that will be the opposite of busy social situations such as classrooms, training rooms and lecture halls. My guess is that this will lead to a reversal of the fashionable social learning lobby, and a move toward super-efficient, solitary and simulated learning experiences. As I say, that’s a guess. Whatever the findings, if they’re right about using the causal effect between reading body and brain states to accelerate learning, it will unlock a new era of learning, where the learner will become a super-learner, shortening the treadmill that is school, college and University and making massive gains in learning across your lifetime. It will do for lifelong learning what the jet engine has done for air travel. It will be much faster, cheaper and revolutionary. What I particularly admire about this approach, is that it avoids all of that weak, often European funded research on 'pedagogy' (see critique), that seems to get us nowhere. This is focused research with a healthy public-private sector partnerships that want real results. How many wasted hours do learners and teachers spend getting everyone a pen or pencil? They’re thin, narrow and roll unaided, designed therefore, to be lost through any small hole and from any surface. The average person must lose dozens, if not hundreds, in a lifetime. Nothing is more dangerous in classrooms than pens and pencils. They’re used to poke, prick, draw on and even stab others. Empty plastic Bic tubes are also superb pea-shooters. They are, in effect, dangerous weapons. Pens leak, clothes stain, pencil shavings get everywhere. In short, these implements are a cleaning nightmare. A leaked pen in a pocket or bag can cause havoc, staining clothes, flesh and anything else that comes into contact. Encourages bullying through notes and a notes culture around going to the toilet (actually walking the corridors or a sly cig), explaining why you were off that day (forged note from parent) etc. How many learners doodle the hours away, rather than learning. They'll doodle on paper, books, plaster casts and any available surface, even their own hands and arms. A bit extreme but it happens. A compass an ink pen's all you need to get your first boyfriend or girlfriend's name on your arm or those stupid words LOVE and HATE on your knuckles. To NOT allow word processing on writing tasks is to not allow reediting, redrafting, reordering and self-correction, the essence of good writing skills. It actually encourages the regurgitation of pre-prepared, memorised answers. Keeps schools stuck in a world of paper, which can’t be emailed or easily stored. How many pieces of paper with writing are simply lost, deliberately or otherwise by children at school? Paper, pencils and pens cost money, but that is nothing compared to the cost of printing and photocopying, in terms of photocopying machines, printers and print cartridges. Paper production, for writing assignments, destroys trees, uses nasty chemicals and if it doesn't end up as landfill. entails difficult and costly recycling. 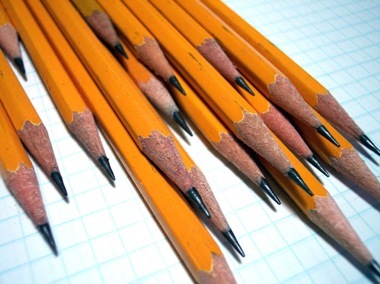 Pen and pencil assessment skews assessment towards writing and away from performance. This has led to an overwhelmingly academic curriculum, at the expense of practical and vocational skills. It encourages primitive, photocopied A4 sheets for homework and mechanical 'fill-in-the-blank' assignments, with the additional problem that homework has to be physically marked by overworked teachers. Automated, online homework and assessment is surely superior. It encourages teachers to use ‘red pen’ marking, highlighting failure, rather than the generosity of formative feedback. Children learn from failure which is why all feedback should be constructive. My kids look at pens and pencils as if they’re Egyptian artefacts. The fact is, that pens and pencils, if used in assessments, actually hinder or skew the proper assessment of attainment. Many of these kids write, incessantly on keyboards, not using pen and pencil. Lastly, when they enter the world of work, if they write, it will be largely on a keyboard. Surely touch typing is a skill worth learning. In a recent debate with Stephen Downes, I spent some time going through dozens of papers and meta-studies showing that the lecture is a largely disastrous pedagogic technique, devoid of formative assessment, diagnosis of student understanding, actual teaching or inspiration. I wasn’t surprised at the qualitative nature of Stephen’s response, as I’ve heard it many times before 1) that lectures are not about ‘teaching’ but ‘showing practice ’i.e. what it’s like to be a physicist, whatever, 2) some lectures are good e.g. Martin Luther King’s speech etc. and 3) lectures must be good as they’ve been around for so long. I don’t buy any of these arguments as 1) that’s not what lecturers or students think, expect or require, 2) the fact that a chosen few can do something well (like surgery or any other form of expertise) doesn’t mean that it should be done by everyone 3) slavery was around for millennia but it doesn’t make it right – you can’t derive an ‘ought’ from an ‘is’. In any case, I’ll beaver on uncovering the evidence where I find it. In this week’s Science, a Nobel Prize winning physicist and associate director of science at the White House Office of Science and Technology Policy, Carl Wieman, along with researchers Louis Deslauriers and Ellen Schelew, published a paper ‘Improved Learning in a Large Enrolment Physics Class’ that shows improvements in attainment, attendance and attitudes in students when lectures delivered by senior experienced academics are abandoned in favour of approaches where postdocs, interactive techniques and formative assessments are used. 1. Control group (267 students) taught by experienced faculty member with years of experience teaching the physics course and good student evaluations. 2. Experimental group (271 students) taught by a postdoc with almost no teaching experience in introductory physics, using proven, researched, learning techniques. The groups were taught a module in a physics course, in three one hour sessions in one week. In short; attendance increased, measured attitudes were better (students enjoyed the experience (90%) and thought that the whole course would be better if taught this way (77%)). More importantly students in the experimental group outperformed the control group, doing more than twice as well in assessment than the control group. Academics will go to great lengths to defend traditional lectures, even abuse, (see my Don’t lecture me! ALT talk complete with abusive Tweets). However, there comes appoint when the evidence (surely a fundamental tenet in HE) must win out. This paper points towards something that decades of research have confirmed, that there must be a rethink on lectures. We may then have a chance to dramatically change teaching in Higher Education for the better, also making to cheaper. In other words, get good teachers to teach and let researchers research. The two competences may overlap but they are not congruent.